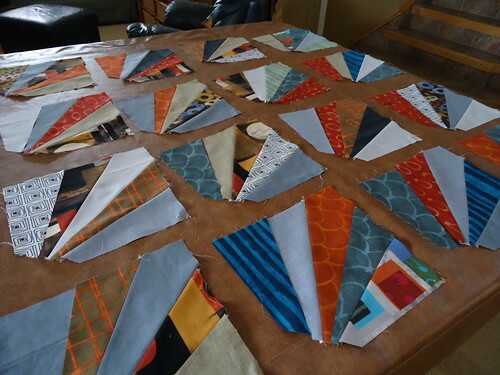 This assembly line type quilting moves along rather quickly. I'm using a method from the book Crazy Shortcut Quilts. 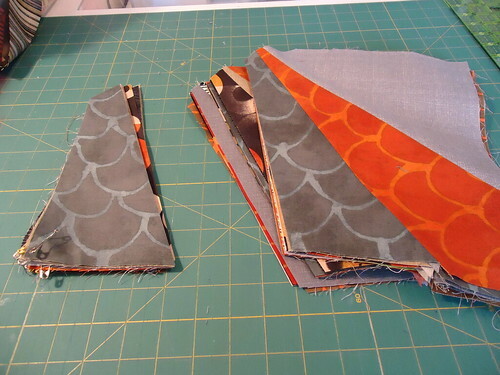 If you are familiar with Karla Alexander's work, the Stacking the Deck method is fairly similar, except you only make one cut....then sew and then the next cut....then sew, and on and on until your block is complete. My husband's pool table gets a good work out, as I lay out all the blocks after each cut. I'm happy to say I finished nine blocks (only six are shown) in pretty quick time, since I want to keep up with the QAL. 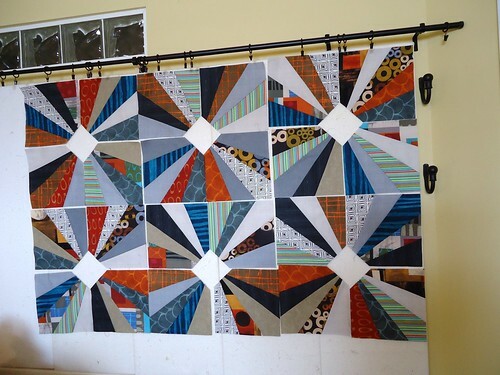 The next step is to play around and come up with a layout I like and works well, with the QAYG method, I want to use to join the blocks, after they are quilted. gosh, i'm in love with these blocks! OH that looks WELL cool!!! These look great! What a fun pattern and I love your mix of fabrics. Fantastic assembly line going girl. Your color choices are exquisite, as usual.